Reviewing speakers is much more fun than testing cables and connections. However, it requires great care and attention, because of the wide range of products and the different philosophies of construction, which can produce quite different results. The speaker is the most important element in the HiFi chain, having on the final result a much greater impact than the source or the amplifier. As far as the evaluation of HGP speakers is concerned, I want to make clear a few points. I prefer a clean and non-fatiguing sound and a balanced reproduction of all frequencies. I do not like excess of personality, like Cabasse or micromonitors with 9 cm woofers. I prefer towers which take up the same surface of bookshelf speakers, but have greater volumes and go deeper in the lower frequencies. I am not against exoteric solutions, like trumpets, electrostatics and mixed, but, in my opinion, the final result should avoid excesses. The creator of HGP speakers has given the name to his company. 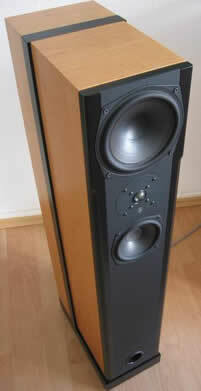 HGP produces speakers in the medium-high price range, almost exclusively towers. Recently, the company has expanded its production into the multichannel sector, proposing relatively cheaper solutions and new active subwoofers. HGP products have names which are similar to Italian ones or are truly Italians, like Lyra, Corda, Vola, Dona, Cento, Ronda. The construction choice prefers towers (one bookshelf, two ways). The HGP range of models starts with Dona (relatively cheap, 1300 Euro/pair), has Corda as central model and ends up with Lyra, at 15000 Euro/pair. I will discuss the Corda model I, even if on the market you can find model II, called SoNova, with additional tweeter placed in the back, in order to give a more pronounced depth/tridimensionality. Today, HGP sells also Corda II or Corda III (de facto a third version) which have double woofer and double midrange and are rather different from the first generation. Elegant, lean towers, in wood, with sharp edges. They can be obtained in different types of wood, some standard, some available on request with 300 Euro/pair additional cost. The front is black and houses the woofer (treated with an exclusive HGP process) on the top, the tweeter (made in silk) in the middle and the midrange just below the tweeter. The cones are placed all in the upper part of the front, and are black in color. The bass reflex opening is placed in the lower part of the front and oriented to the listener. Below the front you will find a thick black wooden basis, which isolates the speaker from the floor of the room. The speaker is therefore placed upon the basis and is divided in two sections, one in front and the second behind, connected by means of internal lines. Such construction should emphasize the low frequencies. On the side, you will notice a black stripe, going from the bottom to the top of the speaker and indicating the separation of the two parts (front and back). 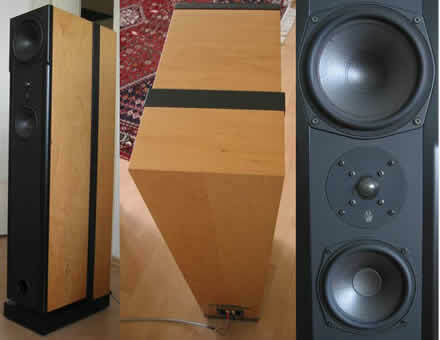 You can view Corda speakers like a pair of towers, placed one against the other, made externally in wood and separated by a thin black wooden element, which ends at the base (also black). The resulting structure appears like a long asymmetric T, turned upside down. The black color makes a vivid contrast with the light color of the tower, the design is, in my opinion, sufficiently original without too much exotism, and fits well in different environments. It should be noticed that this "two towers" aspect, easily noticeable from the side, has disappeared in the new Corda, which have slightly curved sides with no interruptions. The towers have a modern design, a limited front section, a high, narrow and somewhat deep structure. These towers, however, do not exasperate their impact, like with some German products (for instance Canton, Fisher & Fisher, LUA), which install the woofers on the sides. The towers have of a woofer limited by the size of the front. No use is made of passive membranes, like ALR. The internal structure is very original and consists of two adjacent chambers, the one in the back should amplify and underline the low frequencies. The baffle is made of composite in order to reduce resonance (sandwich developed by HGP). The structure is stiffened in several positions. The "big foot" isolates the speaker from the ground and therefore spikes are not needed. The only part made of plastic is the small tray placed in the back and containing the contacts, which are golden plated and properly positioned (biwiring allowed).